Hostal La Fuente i Córdoba, Spanien: Reservér nu! Hostal La Fuente is located in San Fernando Street, 5 minutes from the Mezquita-Cathedral. We have 2 big lounges available for celebrations and business meetings. Also, we have a restaurant and free medical service. 40 rooms equipped with air conditioning, heating, television, hair dryer, minibar, safe, fully equipped bathroom. 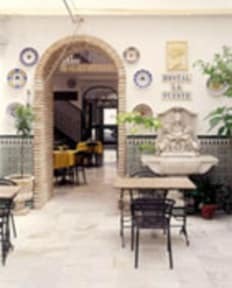 The hotel has a restaurant, bar, own parking, meeting room, convention facilities, and a traditional Andalusian patio..